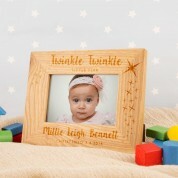 Surprise any new baby with this beautiful customised laser engraved oak frame. Beautifully designed with the children's nursery rhyme 'Twinkle Twinkle' and sprinkled with lots of little stars, this frame is sure to bring a little twinkle to your home. 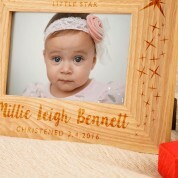 The frame will be personalised to include babies name and a short message, such as a christening dedication or a short with love message, to make this a super special gift for any new born. Dimensions: Approx. 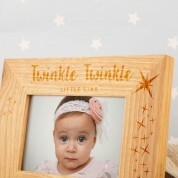 23 x 18 x 2cm.